July 12th 2016. 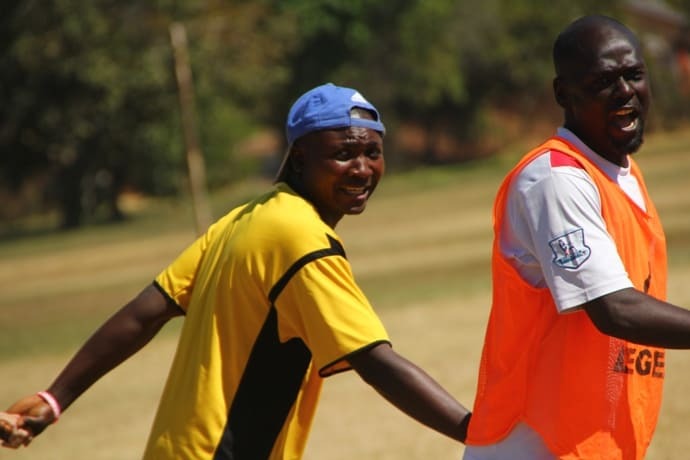 Community Impact Coach Elvis Nshimba wrote about his time with CAC and Malalo Sports Foundation in Chililabombwe, Zambia. I’m very happy and honored to work with Coaches Across Continents. In 2014, I attended the training of CAC games in Lubumbashi within my organization (Malaika Foundation). The following year I attended the second training with interest and was committed to implement what I was learning. I realized that working with Coaches Across Continents as a Community Impact Coach is an important thing for my life and for my organization. My application was accepted and I was appointed to go and implement games we learned at Chililabombwe in Zambia. Being my first time to work as a Community Impact Coach in a foreign country, I felt very excited as my need to travel is growing. I had a great week in Chililabombwe from the 3rd to the 10th of July with a great team: Nora Dooley, Ruben Alvarado, Macie Jones and Nico Achimpota. I began teaching games that I didn’t know before, but as a Community Impact Coach, I was able to read them once and understand what I could do with local coaches in Zambia. Teaching the first game wasn’t so easy, but the second and the following were great games we taught. In this trip, I learned many things about people, their lifestyle, different issues they have in their community and I improved my English. Zambian coaches were very kind, friendly and humble. They were good at implementing games we taught them, and committed to positively impact their community by using sport with boys and girls. I would like to thank very much the Boards of Coaches Across Continents who allowed me, through this program, to go beyond my country, and as a Community Impact Coach, I wish to keep on running On-Field programs with them any where they can send me as a volunteer. I’m also grateful to Ruben and Nora who helped me improve my knowledge in implementing games. As long as this program keeps on being run, I hope to contribute with my knowledge and my energy to impact the world with positive messages through sports. Previous: Win A One World Futbol! Elvis you have a passionate story to tell to many generations.I am a coach too and i really appreciate the way you tell your story.There are so many conflicting issues especially on cultures in the whole world that can be solved in the simple game of Kicking the ball around and making friends instead of drawing lines that separate us. Indeed CAC and its programme is so simple a way of doing it courtesy of its CICS. I have personally trained as a coach through the very able hands of especially Madam Coach Norah Dooley.I have applied for coaching experience as a volunteer outside my community,an opportunity with great expectation. In fact i encourage Coaches to register themselves for training with their Local Organizations. On the same note the Local Sporting Organizations should look for partnership with CAC in order to make this world that is round like Football,much safer for us all! In fact there are bridges near my town known as ‘Moi’s Bridge’.They were built to assist people cross big rivers and avoid the danger of falling prey to animals such as Crocodiles and Hippos (River Yala and Nzoia in Kenya). Precisely ,Coaches who enroll in CAC initiatives indeed become these bridges to help people solve their own problems regardless of their diverse backgrounds. Like Elvis, Mine is an opportunity in waiting!I cant just help…but wanna see and implement games that i was taught a year and half ago.I remember those games almost so vividly as if they were taught me just yesterday.